I am willing to play if our political leaders simply put the facts on the table. For example, the proposal to use a “chained” CPI for indexing Social Security benefits—which was floated during the recent fiscal cliff negotiations, and seems likely to surface again—is not just a “technical correction”; it is a benefit cut. This “more accurate” measure is projected by Social Security’s Chief Actuary to rise about 0.3 percentage points more slowly each year than the current index. If we were starting with a price index for Social Security that properly reflected the spending patterns of the elderly, then moving to a chain-weighted index might improve accuracy. The problem is that the current index understates the price increases experienced by the elderly, since, for example, it does not reflect the fact that older people spend much more on health care where prices are rising rapidly. An experimental index for the elderly is projected to rise 0.2 percentage points more rapidly than the current index. So moving to a chain-weighted index without correcting for spending patterns is a reduction in benefits. The 0.3 percentage point decline in indexing associated with switching to a chained CPI may not sound like a big deal. And, indeed, it is not for young retirees. The problem is that the effect cumulates over time and results in substantial benefit cuts for the very old, who are more likely to be women. A COLA that is 0.3 percentage points lower each year would produce a monthly benefit that is about 6.5 percent lower by the time a retiree reaches 85. To compensate, some proposals include a one-time 5-percent benefit increase around age 85. This adjustment helps at that age, but then the cut continues. Even with the adjustment, the COLA change eliminates one fifth of the Social Security 75-year shortfall; it’s a benefit cut. That said, the COLA is probably fair game in restoring balance to Social Security. It is the only way to have current retirees contribute to the effort. My view is that we – the over 55 crowd – have not behaved very well. It has been very clear since the early 1990s that Social Security would need additional money to maintain current benefits. Yet, the baby boom, instead of raising taxes on itself, kicked the can down the road. Now that we are over 55, we want to foist the burden on younger generations. That does not seem fair. The conventional argument for protecting Social Security participants is that older workers and retirees do not have the flexibility to adjust to benefit cuts. That is true, and any change to the COLA would have to be applied judiciously. The vulnerable would need to be protected. Thus, COLA changes would have to be implemented on a sliding scale, perhaps based on family benefits. But leaving all those 55 and older untouched no longer seems like the right answer. In terms of the broader issue of whether Social Security should be part of the budget negotiations, I wish it were not. Its problems are not that serious, and a host of vetted options are available to close the funding gap. The current politically-charged arena doesn’t seem like a very good place to do business. A commission with a narrowly-targeted mandate from Congress and a no-amendments, up-or-down vote similar to the recommendations of the Defense Base Closure and Realignment Commissions seems like a better way to go. 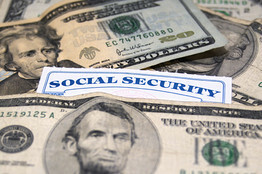 On the other hand, Social Security is in the mix, and it seems hard to argue for not making any change to the program. Any solution will ultimately require some benefit cuts in addition to new revenues. So I am not adamant about having no changes, but I would appreciate it if the negotiators called a spade a spade.